Alarm bells should ring when you do a homecheck for a friend of someone you know. For some reason, they always seem to go wrong one way or another. We knocked on the door, and the lady warmly welcomed us in, taking us through the side-gate round to the conservatory. They were an older couple, and they seemed nice enough, offering tea and biscuits. 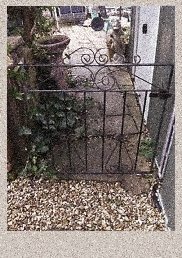 Their garden was largely secure but there was one concern; their gate was a very small wrought iron one; not only could a dog push through the gate itself, but it was so low anyone (even a toddler!) could reach through and open it. Unfortunately, their gate was directly opposite a bus stop, and when we arrived there were 10-15 school kids queueing for the bus. “I’ll get the tea,” the lady said, disappearing into the house. We carefully explained to the gentleman why we carry out homechecks, and then broached the subject of the gate and the bus stop. Unfortunately, he didn’t see our point.